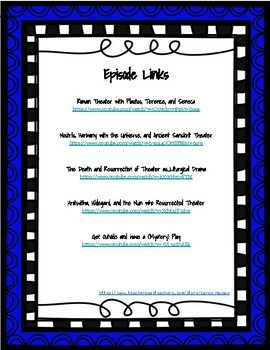 Episode Guides for Crash Course Theater & Drama YouTube Series! Plus it's only $1 per episode! -Pacing within the episode is about 1 question every minute. Ep. 6: "Roman Theater with Plautus, Terence, and Seneca"
Ep. 7: "Nostrils, Harmony with the Universe, and Ancient Sanskrit Theater"
Ep. 8: "The Death and Resurrection of Theater as...Liturgical Drama"
Ep. 9: "Hrotsvitha, Hildegard, and the Nun who Resurrected Theater"
Ep. 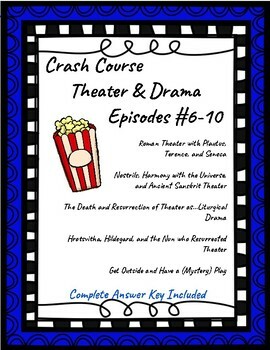 10: "Get Outside and Have a (Mystery) Play"
What is “Crash Course Theater & Drama”? “Crash course Theater & Drama” is a YouTube series that is fast paced and packed with information and facts about the history of theater. It is a fantastic introduction to a topic, a great review, or a quick overview if you are running short on time. Though the episodes are dense with facts, Rugnetta explains theater's history in a way that reaches all learners, while still succeeding in making it fun, light-hearted, and relevant for students. Most episodes also include a summarized play that is told through animation. These offer students the chance to experience a famous play form history in a way that is completely understandable and accessible. A link to the episodes is provided in this product. -Preview of a new topic. 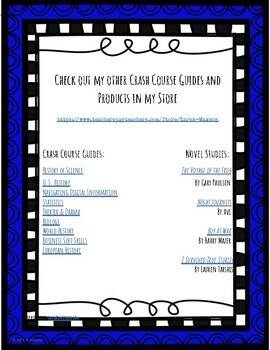 Additional Crash Course Theater products can be found here. See my store for more products for Math, Science, History, and Language Arts!